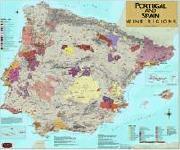 Spain Wine Maps from Omnimap, a leading international map store with over 250,000 map titles. Spain Wine Map. Vinmap. The land where wine is elaborated, not fabricated. Explore DOs and DOC amongst the rustic and beautiful terrain that is Spain. Size is 30 x 36". Spain & Portugal Wine Map. Vinmaps. This is a new combination map of Vinmap's separate Spain and Portugal maps. Ideal for those with less wall space and wanting both countries on a single sheet. Size is 30 x 36 inches. Spain/Portugal Wine Map. DeLong. Includes all wine regions of Spain and Portugal along with adjacent regions in France, Morocco and Algeria. Size is 24 x 36". Also available framed in an elegant black wood frame with acrylic cover sheet (25 x 37" framed).